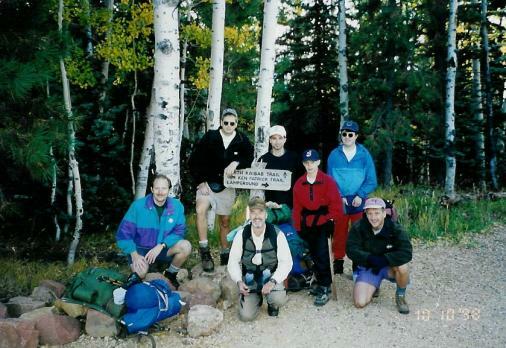 In October of 1998 I did a Rim-to-Rim hike thru Grand Canyon with a group of friends. It was an outstanding trip. Easily the best trip I’ve ever done. Since we chose to hike from the North Rim to the South Rim we met at the South Rim and took a bus to the North Rim. It was a long bus ride. Something on the order of 350 miles if I recall correctly. There is a whole lot of nothing along that drive. That’s actually ok with me, it’s just striking how you can drive for such a distance and see nothing but the occasional Navajo home with the traditional hogan beside it. Once we got to the North Rim we spent the night in a couple of rustic cabins on the rim and made our final preparations for the trip. We got to the trailhead of the North Kaibab trail at around 6:00am to start the day’s hike. Our plan was to hike in to Phantom Ranch on day one, stay down at Phantom Ranch for day two, and then hike out to the South Rim on day three. We had accommodations in the bunkhouses at Phantom Ranch so we only had to pack our clothing, sleeping bags, and of course lots of water. It’s a 14.5 mile trip from the start of the North Kaibab trail to Phantom Ranch. You descend over one mile most of which is accomplished in approximately the first third of the trip. The picture below is me late in the afternoon hiking in The Box. It’s a narrow section of Bright Angel Canyon. You walk on the trail beside Bright Angel Creek. Because the walls of the canyon are so high and steep and it was late in the afternoon when I got there it was cool and shady and a nice change from the heat of the previous hours. When we left the North Rim it was very cool (approximately 40 degrees F) but as we descended it got warmer and warmer until once we reached Cottonwood Campground it was very hot and time to strip off layers to shorts and T-shirts. The total trip down took me about 12 hours. I was in no hurry and thoroughly enjoyed the day. My friend Tim and I agreed that we weren’t going to stop until we reached the Colorado River so we continued past Phantom Ranch down to the river. Once we got there we dropped our packs, took off our boots, and waded in. The water was intensely cold but refreshing after the long day of walking. I would not have liked to go in any further than you see in the picture though as the water was so very cold that I would have likely gone into cardiac arrest. Phantom Ranch is 87.7 river miles below Glen Canyon Dam. The water temperature is in the low to mid 40’s (degrees F). This is simply amazing when you consider how hot it gets in the Inner Gorge. The next day we just relaxed and roamed about the general area of Phantom Ranch. Here is a picture of Tim, Jeff, Tony, and I.